This is an indulgent dessert without the unhealthy fats and empty calories. You can mix up the flavour by changing the fruit! Begin by pre‐heating your oven to 180C. Chop your berries transfer to two small ramekins! 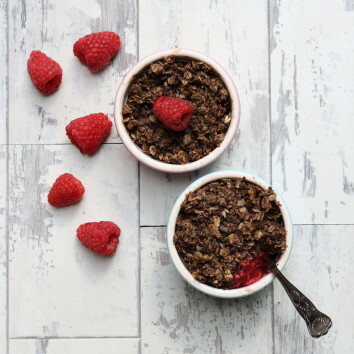 Next, simply mix your oats, coconut oil, rice syrup, and cacao powder in a separate bowl, until combined and sticky! Layer this mix over the top of your berry filling, and place the ramekins in the oven for 7‐10 minutes, until the top is crispy. Enjoy!